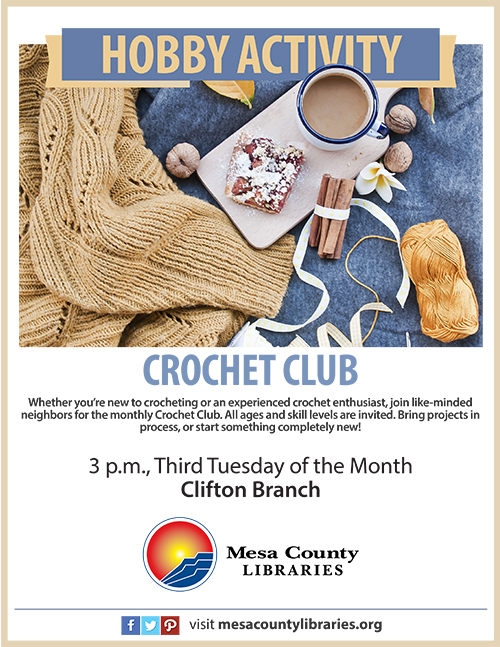 Whether you’re new to crocheting or an experienced crochet enthusiast looking for like-minded neighbors, plan to join a new crochet group that will meet monthly at the Mesa County Libraries Clifton Branch, 590 32 Road. The Crochet Club plans to meet from 3-4 p.m. on the third Tuesday of each month, beginning Jan. 16 at the Clifton Branch Library. Anyone of any age or skill level is invited, and there is no charge to participate. Limited crochet supplies will be available for those who don’t have their own. A crochet teacher will be present to help beginners (and others who have questions). If you have projects in progress, please bring them to work on, or start something completely new! Posted in Branches, Crafts and Hobbies, General, Library News, Programs/Classes.